The Go Rhino 4000 Series Black Nerf Bars feature a sleek black powder coated finish that looks good on any vehicle. The 90 degree bends keep the mounting brackets out of view giving these bars a streamlined look. This also leaves the step area free of obstructions allowing easy entry and exit. Go Rhino brings reliability and funtion to the classic black nerf bar with style. Go Rhino step pads are highly slip resistant. This is a vital quality, especially in inclement conditions. Wet or cold conditions can increase the chance that you could fall. Go Rhino slip resistant steps will create an extrs layer of safety that's very important. The Go Rhino 4000 Series Black Nerf Bars conveniently put a step at the base of every door. The Go Rhino 4000 Series Black Nerf Bars come with a 5 Year Warranty that will cover any manufacture defects. Go Rhino 4000 series 3" nerf bars are available to fit a wide range of trucks and SUVs in three different finishes. That means that no matter what you drive, you're likely to find a pair of these truck side steps that's just what you're looking for. 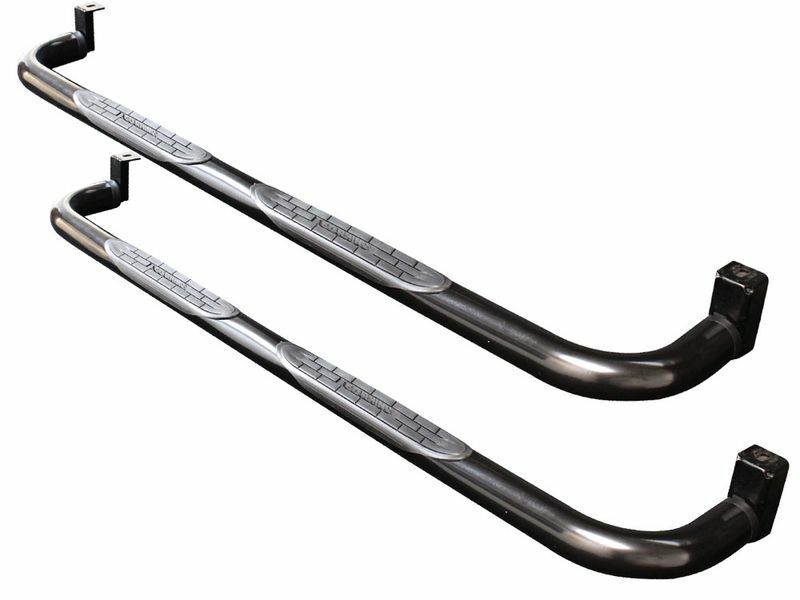 With the range of options and flexibility they provide, you may not need look any further for your next pair of side tube step bars. With their durable construction and oversized step pads, Go Rhino 3" step bars are made to be long lasting while giving your feet plenty of stepping room. Their slip-resistant design ensures safety and stability every time you get in or out of your vehicle. They're also backed with a generous limited lifetime warranty on polished stainless steel or a five year warranty on black or chrome. Installing your Go Rhino 3" nerf bars is also made easy with custom bracket mounting kits made to fit the make and model of your vehicle. On most models, no drilling is required. Combined with their ruggedly tough construction and sharp sense of style, these are amongst the cream of the crop when it comes to step bar excellence.